The small photo inset to upper left is this same Fire barrel with water on its’ spines. 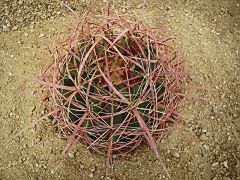 These grow near Lake Mead at fairly high elevation so can take a lot of frost and still stand the blistering desert sun. 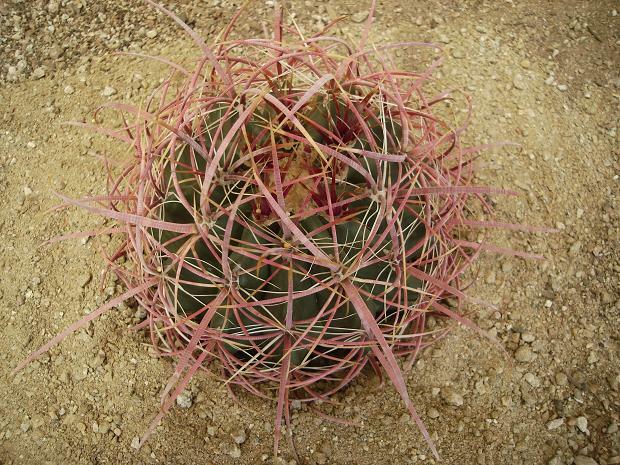 They grow very slowly as their desert only gets a few inches of rainfall each year. The bright yellow blooms come in late spring and are nearly invisible under this mass of bright red spines. This plant has been blooming for years and is ready to dress up your landscape or your collection. There is not a better red colored barrel anywhere so go ahead and look. We have a decent stock but they sell out each season. 1st photo represents plants we ship. Second is a larger specimen for reference only.